School Dinners cost £10.50 for the week, payable in advance please. To find out if you are eligible to apply for free school meals contact 0151 934 3590. By popular demand, St Elizabeth’s now has it’s own Deli-Bar. 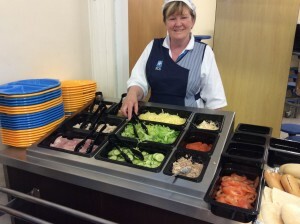 The Deli-Bar serves healthy sandwiches with a choice of bread and fillings each lunchtime. For the price of a normal school dinner, children can choose a sub, dessert and drink. Looking for some ideas for a healthy lunchbox?